Protecting and upgrading your residential electrical system is essential for you to enjoy all the conveniences—and the essentials—of a modern home. To take care of all the services that your electrical system may require, you must turn to professional, licensed electricians, such as the experienced team at All-Pro Electrical & Air Conditioning. Since 1995, we have provided versatile electrical services for the Boca Raton area. We offer a wide range of services, from simple installation jobs hooking up carbon monoxide detectors to extensive new indoor and outdoor lighting. We take pride in our work and our dedication to safety and precision, which is why we offer a 100% satisfaction guarantee. Give us a call today to find out more about the numerous services we provide, or to schedule fast and effective work. We have electricians standing by 24 hours a day to see to any immediate repair needs. The electricians at All-Pro Electrical & Air Conditioning offer an immense range of electrical services for Boca Raton, FL and the surrounding areas. You may feel tempted to break out the tool box and pliers to try an electrical repair on your own, but you should resist the draw toward DIY. Electrical work is potentially dangerous for amateurs, not only because of the risk of a high voltage shock, but also because poor work can lead to fire hazards. You must leave any job, no matter how large or small, to licensed electricians. Not only will experienced electricians get the work done fast and accurately, but they are also familiar with the local electrical code and will see that your house lives up to it. The trucks at All-Pro Electrical & Air Conditioning are fully stocked and ready to go whenever you need our services. 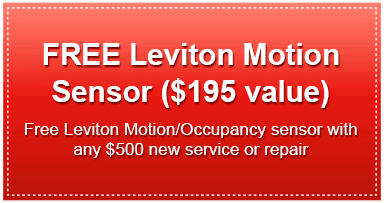 We can handle most repairs and installations with our first visit to your home. Just give us a call to arrange for your electrical services in Boca Raton, FL. Below is only a partial list of the jobs we do; if you are curious about another electrical service, get in touch with us because we probably do that as well! One of the best ways to save money on keeping cool during a hot Florida summer is with professionally installed attic fans. These fans will reduce the intense heat inside the attic and prevent it from seeping down into the rest of the home and raising the temperature. Carbon monoxide is colorless, odorless, tasteless—and dangerous. To defend your family against this potential danger, call for our electricians to wire up CO detectors. A ceiling fan is both an attractive home decoration and an aid in cooling down without running the air conditioner constantly. Our electricians are glad to outfit your home with as many ceiling fans as you need to make your home more pleasant and help lower your AC bills. If your home still has an old fuse box, it’s time to upgrade to a circuit breaker. And if your old circuit breaker has seen better days and no longer works as well as it should, you can arrange for a new panel to be installed or have the old one repaired. We are available to service your circuit breaker panel. The wires that run through your home are the veins and arteries of the electrical system, and it’s essential they receive proper repair, installation, and replacement work. Call on our electricians for whatever electrical wiring assistance your home requires. To help save room in a house and make your entertainment system as attractive as possible, mounting a flat screen television against the wall is an excellent idea. We will see that your TV is mounted correctly and the wires run through the wall to hide them. A GFCI (ground fault circuit interrupter) outlet serves to protect people in your household from receiving dangerous electrical shocks. We provide installation of GFCI outlets for homes that need to upgrade to these safer devices. Does the inside of your house feel drab? Do your workspaces lack sufficient light? Do you think you are paying too much to illuminate the interior of your home? Give us a call: we provide indoor light installation and repairs and specialize in LED lighting that will help you save money. Revamping outdoor lighting can give your home a facelift that’s far more economical than extensive remodeling. Our lighting professionals can help make your outdoor lighting better and less expensive to run. A smoke detector is another essential safety device for any home. 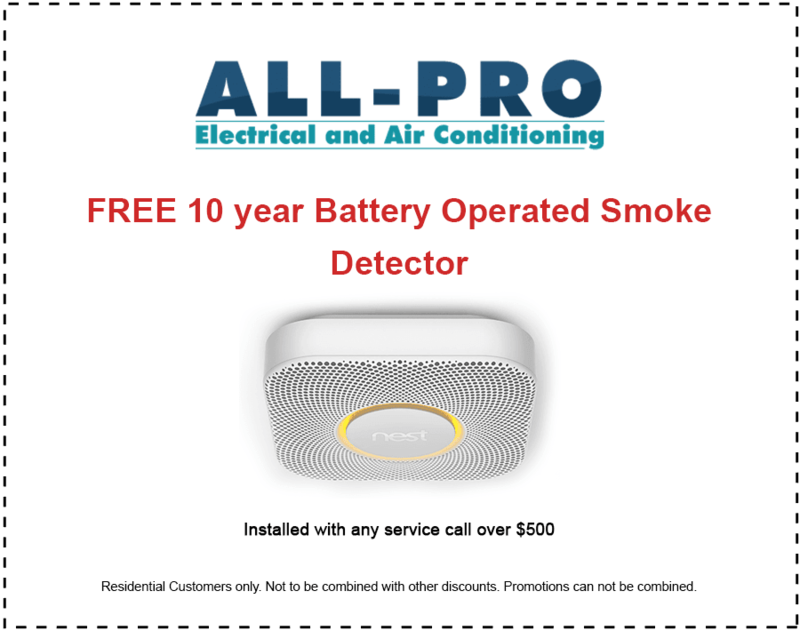 The electricians at All-Pro Electrical & Air Conditioning can take care of installing, replacing, and repairing your smoke detectors so they are always prepared to protect you. Simple power strips can help prevent damage to computers and other precision equipment in a home, but against larger surges they won’t provide much help. We install whole–house surge protection that will keep all of your electrical system safe from sudden voltage increases, no matter their size.